Behold! 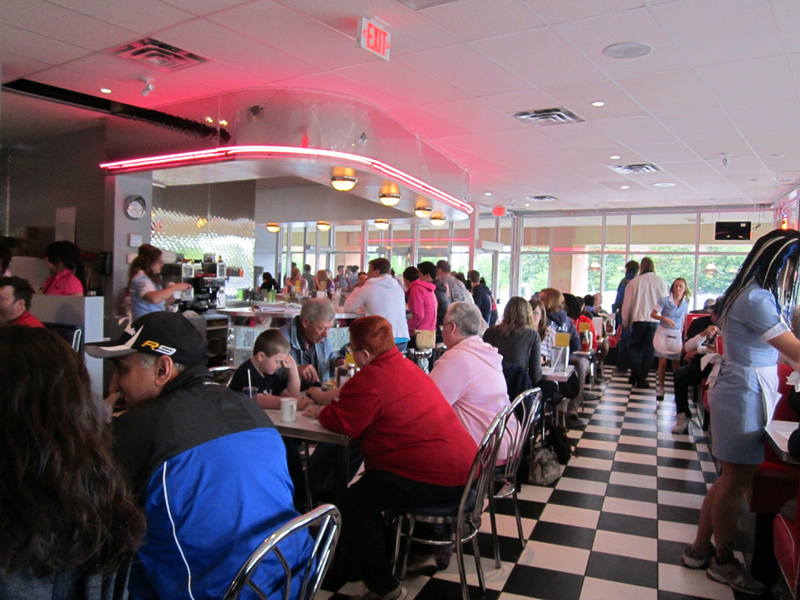 Mel’s Diner reborn in Kitchener. Transportation: Take the GRT Route 12 to Westmount and Ottawa, and you should be able to see it as soon as you get off the bus. 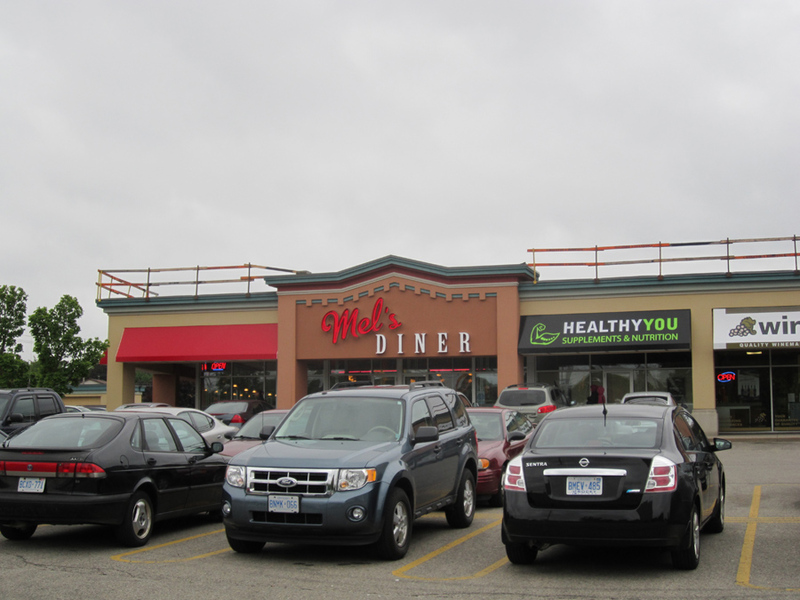 Mel’s Diner was formerly located in the Campus Court, next to the University of Waterloo before it burned down, rather spectacularly, with the rest of the plaza. Mel’s was probably the most missed of the places that were affected in the fire. 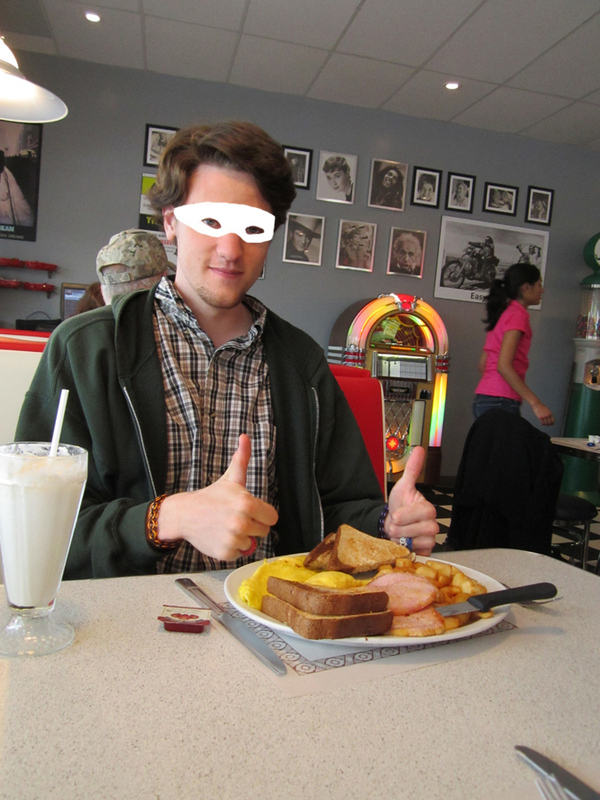 It’s a legend of a diner that has been passed down through the years, from 3 dollar burgers, to fighting the Godfather, club bouncers taxi-ing in from Kitchener after work to eat Easy-riders, all-day breakfast. The ultimate 24-hour hang-out spot, clearly aimed at the sleepless university crowd. 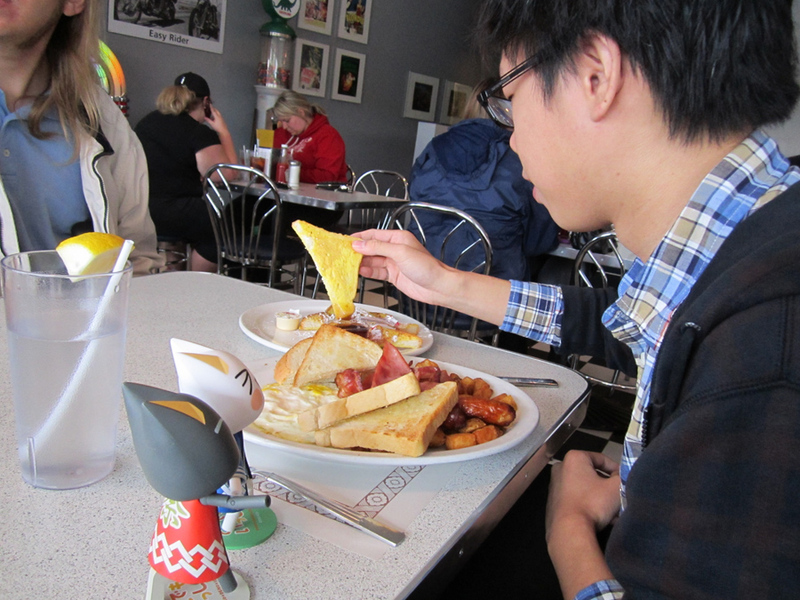 Robo mentioned that the prices for burgers went up, but the breakfast menu selections and prices looked about the same. Truthfully, I never had that many memories of Mel’s compared to a lot of older students. 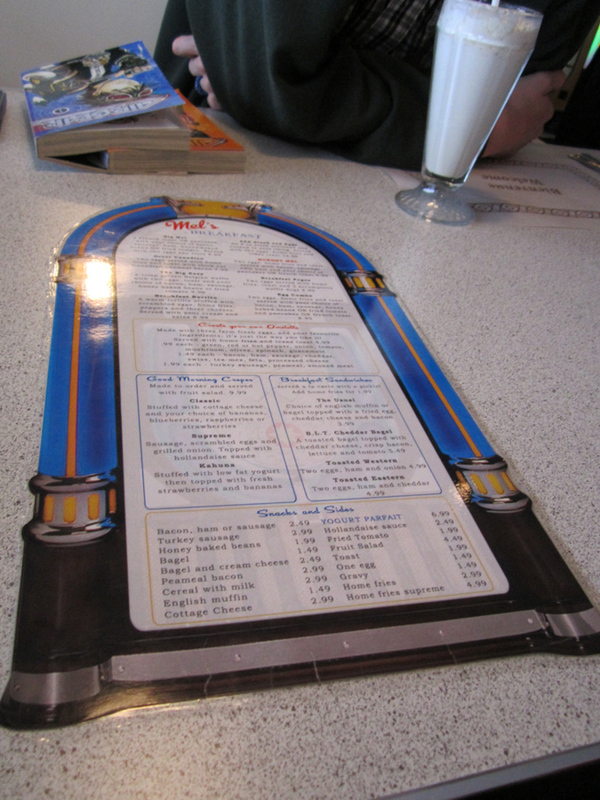 CTRL-A made the club meme of “Let’s go to Mel’s! Oh.”, and jokes aside, I think most people miss it because of the memories of why you were there. I never went to Mel’s alone…whether it was a stray friend, or a gang of Imprint-ers that pulled an all-nighter to finish their section. Anyways, you get the picture. KZ commented that there wasn’t enough posters, neon lights, and random paraphernalia around (don’t quote me >< ), in which I agree. XD But it’s getting there. Bar area. It was fairly busy, with a constant line at the door at people waited for seats. Mostly seniors, less of the student crowd. 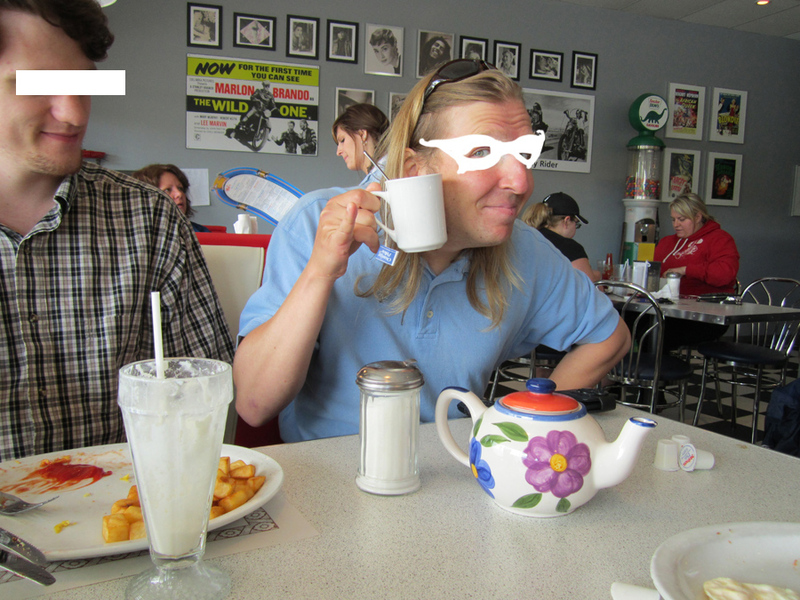 I hope you guys enjoy the photos I posted enough to go support Mel’s Diner in Kitchener. I’m looking forward to going to the one that is re-opening in Waterloo come September…maybe you’ll come with me? Or rather, fight off the frosh (yes, FROSH, not “first-years”) for a seat. And if you can’t make it, maybe you’ll have time later. 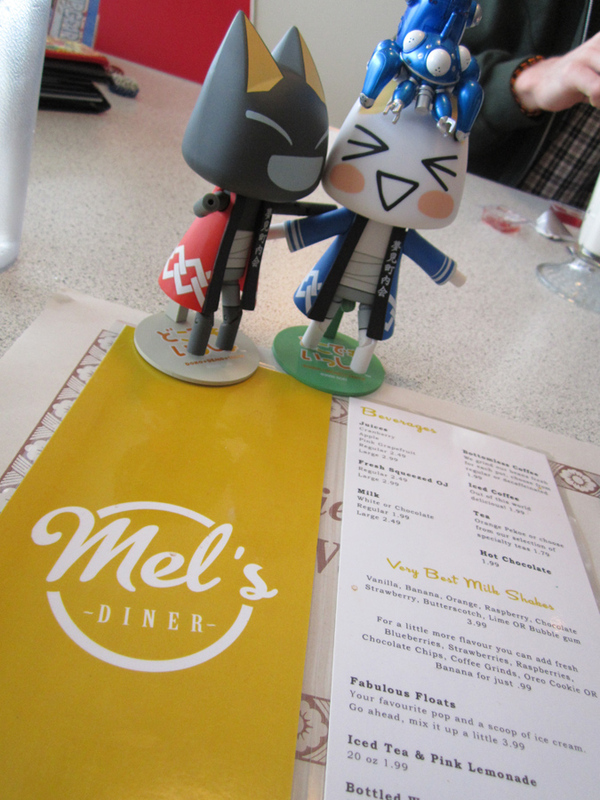 Until then, feast your eyes on Mel’s, and be jealous/excited. ;D No, I will not review it, because you’ll know it would be positive, and frankly, I don’t know much about reviewing dining experiences. 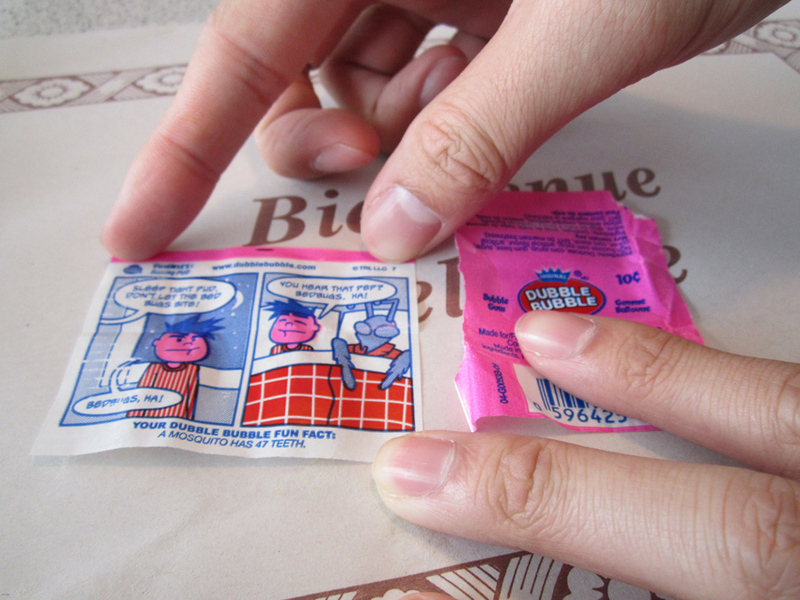 But it felt like the old one, and I was with friends I hadn’t seen in a while, so it was a lot of fun. 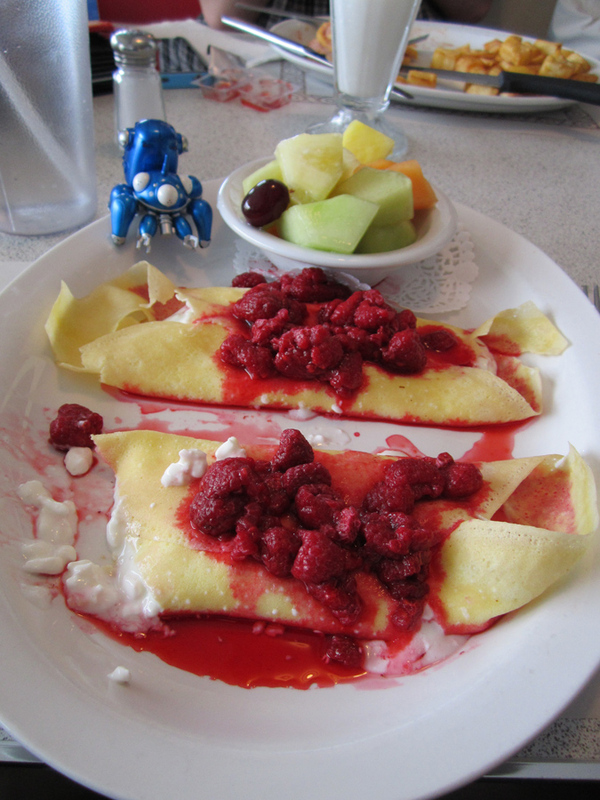 Crepes…I will not order one with cottage cheese next time. Seems like the cats want to be fed. In other news: you may have noticed that the ad I posted a while back has been answered about Kuro the cat needing a home. Kuro will be sending out replies to everyone that answered his ad very soon (he seems pre-occupied with E3). Thanks to everyone that wrote to him to welcome him to Canada, and the interest in having him as a roommate. So, who is his roommate? Well…err, I guess he was won over by the PS3 at his new home, and the abundance of food. Well, the company is good, too. 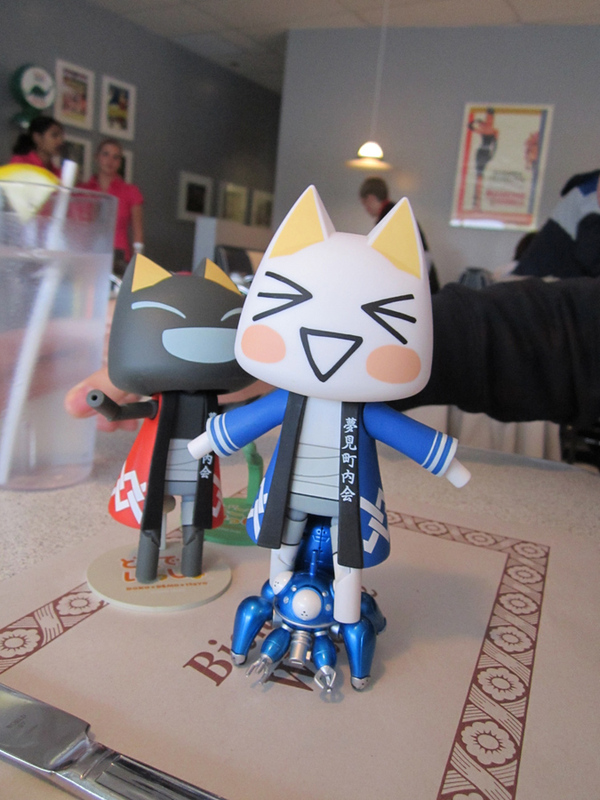 Toro, please take care of him, and try not to stay up too late playing games together. Seriously.